A new litter has arrived Feb. 15! Griffin and Finnegan will be ready to go home after April 12th! Price of $2500 includes health record, teddy bear, carrier, NUVET vitamins, puppy food, and 24/7 care instructions. The CavaMaltiPoo is an ideal lap puppy for those with allergic family members and for those who are wanting an adult weight of 6-9 pounds. No obvious shedding with these little guys! They will make wonderful apartment dwellers and travel companions. 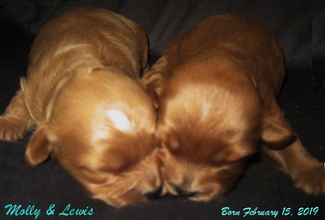 Two males were born to Molly & Lewis on February 15th. They will be ready for their new homes after April 12th. Feel free to call anytime for more information & pictures.